Big Skies Bike Rides is the name given to eight cycle loop rides 'launched' in 2010. They take their name from the phrase used by David Hockney when he compared the sky over the Yorkshire Wolds to 'the big sky' he experienced in the American West. This 24-mile route starts in the centre of Driffield and passes through Skerne, Wansford, Lowthorpe and Nafferton. I rode almost all of this route a couple of months ago. It was one of my first rides this year, and I've been trying to think of something positive to say about it. To be honest there isn't a lot. In fact, the best part of the day's journey was getting to the start, such as riding along the lovely road near Bracken. I hadn't planned to do this ride, but only one other cyclist turned up on this Sunday in the middle of January. I showed him the route and we set off from Cottingham. After something to eat and drink in Bell Mills cafe (we didn't go in to the centre of Driffield) we returned to Skerne and followed the map. 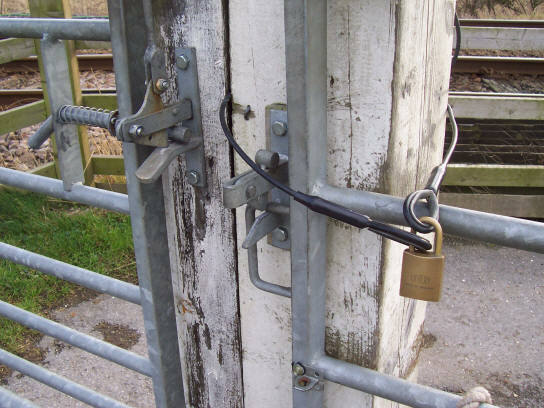 There is little that I remember about the ride to these locked railway gates. Cyclists and pedestrians can get through, obviously, but I'm not sure how long the road has been closed to motor vehicles. Unlike the pretty signal box and the lovely view at Howsham I passed by last weekend, there was nothing nice to look at here. The road either side of this locked railway crossing was, unsurprisingly, rather quiet. 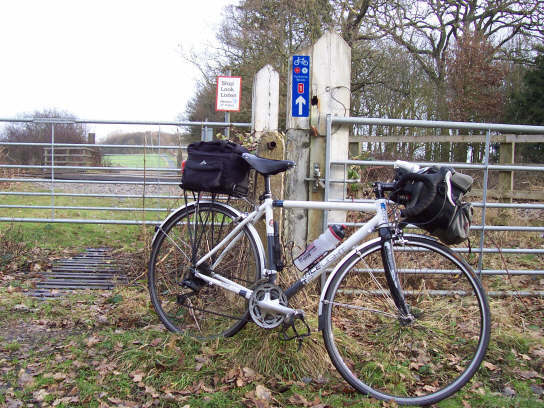 We rode through Lowthorpe (NCN 1 bypasses this little village) then Harpham before fiinding the next crossing shown below. This was a more pleasant part of the route, but my companion for the day – despite riding a mountain bike – wasn't impressed by the amount of mud and standing water on the road. (He was thinking of the other residents in his block of flats and didn't want to leave muck on the stairs.) I had that same sinking feeling you get when you invite someone to see a film or play and slowly realise that they are not enjoying it. There's not a lot of room to squirm on a Brooks B17 Standard saddle, but I managed somehow. Another railway crossing closed to motor vehicles, here on route 1 of the NCN. This is the third of five crossings of the Yorkshire Coast Line you would make if you were to cycle the full Driffield Big Skies Bike Ride. The road out of Kilham was a little too busy for my liking and I was glad to get off it. I turned left and cycled towards Nafferton Wold (not signposted, I think, but there is a house at this junction). This steady climb should have been the best part of the route – it was the only hill. Unfortunately, visibility was poor and I couldn't even take a decent photograph. I crossed the A614 once again and then cycled in to Nafferton. That crossing is marked on the Big Skies Bike Rides booklet with the fourth of five red triangular warning signs. I didn't fancy ticking off the last of them, so I took a more direct route home and called it a day. Not a great view, awful weather, poor camera. This ride came as a disappoinment after the three previous Big Skies Bike Rides I had done. I think the problem is that the eight rides were conceived to promote cycling from the various towns in and around the Wolds. Driffield fancies itself as the 'Capital of the Wolds', so couldn't be missed off. All of the other rides I've ridden so far have better scenery and more challenging terrain. And nowhere near as many warning triangles. There was also the uncomfortable feeling of riding with someone else who didn't care for the route. And then there was the rough weather to prejudice my view all the more. If you are tempted to do this route I would suggest trying another one instead, unless flat, quiet lanes interrupted by busy main roads and railway crossings are your thing. 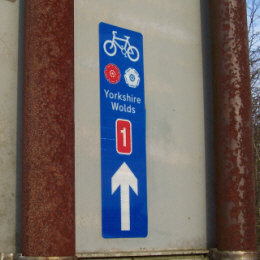 Visit Hull and East Yorkshire Big Skies Bike Rides & Yorkshire Wolds Cycle Route. Posted by Chris on March 24th, 2011. Visit Hull & East Yorkshire must want to be seen to be fair to the various towns in promoting tourism, hence the inclusion of Driffield regardless of the quality of the cycling. I'm not sure what I think about the official 'Big Skies Bike Rides' as they are portrayed. My impression of the Yorkshire Wolds (from only two visits) is that for day-ride leisure cycling it is superb but I'm sceptical whether prescribed rides are a good idea, although I think it's good that you are doing them and reporting back, so to speak. Has anyone except you actually done these rides, I wonder. Im looking forwarding to visiting bits and bobs of the Yorkshire Wolds. The Way of the Roses goes through some of these. Great post though, and I agree with Patrick, that prescribed rides are good for those who perhaps need a bit of a push for a mapped ride out. Isnt the GPS system fabulous for giving you wings to get out there and ride somewhere? Your 'Big Sky' rides have been great for introducing me to a part of the country that I don't know at all but would probably have dismissed as boring. Anything that encourages people out on a bike to explore somewhere different can't be bad. It's lovely country. The part I've cycled in with Chris is certainly not flat, and the sheer number of lanes to choose from is a big part of its appeal. I have my doubts whether the series of routes being promoted will have much of an impact though. Excellent cycling but there aren't many of the creature comforts people seem to want... cyclists' cafes, pub grubs etc. I'm happy for it to stay as a quiet corner with nothing much except occasional cyclists enjoying some solitude. I love it. 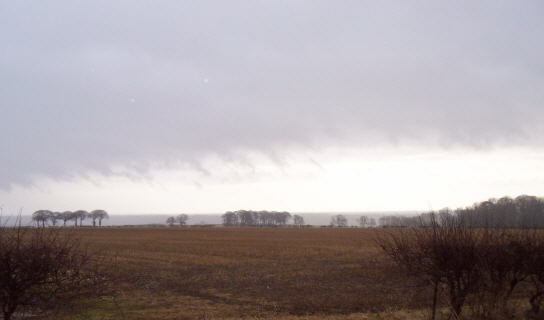 To the west of the Yorkshire Wolds the Vale of York is pan flat. To the east of the Wolds the Holderness Plain is flat too. If you follow the Way of the Roses there are five very pretty miles of steady climbing between Pocklington and Huggate (Patrick and I cycled that stretch of NCN 69 last month). But that route doesn't take in any of the 20 hardest hills in the Yorkshire Wolds. Around the north west region of the area are a few choice 20% climbs. None of them are particularly long, and so don't feature in national statistics of this sort. But the cumulative effect can be quite wearying. Having seen the many cyclists on various routes around Driffield , a year ago we decided to open a small bunk barn at Nafferton (Nether Lane Bunk Barn, named after the crossing its situated on) and whilst I agree that Driffield needs to cater more towards tourism it is slowly beginning to get the message. However, we can do without negative feedback as things can be hard enough when trying to get a new business off the ground so come on all you cyclists enjoy the hills round and about but relish the rest that those tired legs need on the flat routes around Driffield. Hi, Annette. My words above related to Mary's coast to coast journey she was planning to do at the time. She was concerned that the area around Driffield is flat (in fact, despite quite a few comments by me, she would still appear to think that the entire area of the Yorkshire Wolds is flat :???:). The Driffield/Nafferton area is a great base from which to explore the Wolds to the North West or South. For anyone wanting to go out to the (North) East through the Wolds to the coast or South East further down the coast and the Holderness Plain, it is well placed.